English : Little Nemo (1911). Partly animated movie by Winsor McCay. Partly hand painted. M3 Lee tank, training exercises, Fort Knox, Kentucky, United States. 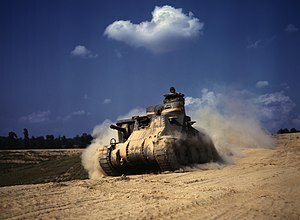 English : M3 Lee tank, training exercises, Fort Knox, Kentucky, United States. The Beijing National Stadium, also known as the Bird's Nest, built for the 2008 Summer Olympics. 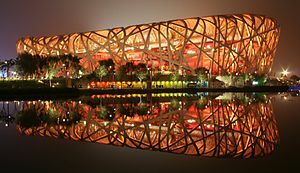 English : The Beijing National Stadium, also known as the Bird's Nest, built for the 2008 Summer Olympics. English : Diesel train "Series KIHA100" passing over Miyamorigawa-river on Meganebashi-bridge (Iwate prefecture, Japan). World War I poster for Canadian wartime fundraising depicts three French women pulling a plow. English : World War I poster for Canadian wartime fundraising depicts three French women pulling a plow. English : Video of the Delta Historic District along Main Street in Delta, Pennsylvania. Cane cutters in Jamaica. 1880s. English : Cane cutters in Jamaica. 1880s. Frecce Tricolori in full formation at the RIAT 2011. English : Frecce Tricolori in full formation at the RIAT 2011. English : Xylophagus ater (a European species of the family Xylophagidae) laying eggs on a tree stump. Xylophagus larvae may prey on bark beetle larvae. Witch's Well (karst spring) in Tuhala (Estonia) is "boiling over". English : Witch's Well (karst spring) in Tuhala (Estonia) is "boiling over". English : View from the Regus HQ Offices at the "Centro Empresarial Jatobá" bulding, neighborhood of Batel, Curitiba, Brazil. English : Sanjo no Taki (waterfall) is located north in Oze area. Waters in Oze damp land area, is gathered to this waterfall,and stream to Japan sea. Daedongyeojido ("The Great Map of the East Land") is an old map of Korea, which was made in 1861. Although no modern survey skills were used for this map, it is almost similar to modern maps. English : Daedongyeojido ("The Great Map of the East Land") is an old map of Korea, which was made in 1861. Although no modern survey skills were used for this map, it is almost similar to modern maps. English : The Brocken Railway (German: Brockenbahn) is a tourist metre gauge railway in the Harz mountain range of Germany. Orangery Bridge in Tsaritsyno Park, Moscow, Russia. English : Orangery Bridge in Tsaritsyno Park, Moscow, Russia. English : Fjordsteam 2013, Bergen, Norway (August 1-4, 2013). English : Impact sprinkler mechanism. Egyptian camel transport passing over Olivet, 1918. English : Egyptian camel transport passing over Olivet, 1918. Cigarette smuggling with a book. This exhibit was on display in the Main Custom Office in Munich. English : Cigarette smuggling with a book. This exhibit was on display in the Main Custom Office in Munich. English : Film Dream of a Rarebit Fiend (1906) by Edwin Stanton Porter, based on the comic strip Dream of the Rarebit Fiend by American cartoonist Winsor McCay. Coromandel Marsh Dart Ceriagrion coromandelianum (male). English : Coromandel Marsh Dart Ceriagrion coromandelianum (male). English : The Molli railway (German: Bäderbahn Molli) is a narrow-gauge steam-powered railway in Mecklenburg. Grey Heron. Taken at Keitakuen. English : Grey Heron. Taken at Keitakuen. Hybrid of Early Marsh Orchid (Dactylorhiza incarnata ×) in Käesalu, Northwestern Estonia. English : Hybrid of Early Marsh Orchid (Dactylorhiza incarnata ×) in Käesalu, Northwestern Estonia. English : Misraħ iż-Żjara tal-Papa Ġwanni Pawlu II in Mellieħa, Malta. English : Panicle of Polypogon monspeliensis. English : Gomateswara Bahubali statue in Karkala, Karnataka. Dushan Tappe, one of Tehran's suburbs, (1899) by Kamal-ol-molk. English : Dushan Tappe, one of Tehran's suburbs, (1899) by Kamal-ol-molk. English : Round view at Moe Goak Monastery, Dala Township, Yangon in August 2013. Harbor entrance with Bavarian Lion, the New Lighthouse and the MS Schwaben in Lindau (Lake Constance, Germany). English : Harbor entrance with Bavarian Lion, the New Lighthouse and the MS Schwaben in Lindau (Lake Constance, Germany). English : Courtship and mating behaviour in the European Lauxaniid fly Meiosimyza platycephala. Kohila watermill with dam on Keila river, built in 1875. English : Kohila watermill with dam on Keila river, built in 1875. English : Time-lapse video of the Rathen ferry, view of Rathen from the Bastei cliffs. The ferry leaves its landing stage on the near bank after another ship crossed, and its floating cable can be seen picked out by buoys. Chestnut-tailed Minla (Minla strigula), Doi Inthanon National Park, Chiang Mai, Thailand. English : Chestnut-tailed Minla (Minla strigula), Doi Inthanon National Park, Chiang Mai, Thailand. English : Animated film How a Mosquito Operates by American cartoonist and animator Winsor McCay. McCay's second film, and one of the earliest animated films in history. A giant mosquito drinks blood from a sleeping man; the mosquito drinks so much that its belly explodes. English : This illustration shows the newly discovered planet, Fomalhaut b, orbiting its sun, Fomalhaut. English : Go-raikou (The sunrise) at summit of Mt.Fuji, Japan. A family photo of an Eskimo mother, father, and son, photographed in Noatak, Alaska, by Edward Sheriff Curtis circa 1929. English : A family photo of an Eskimo mother, father, and son, photographed in Noatak, Alaska, by Edward Sheriff Curtis circa 1929. English : Image stack of a fully expanded apple leaf. Optical sectioning of the ninth leaf from the top of an apple graft (Granny Smith) using multiphoton microscopy. English : Thunderstorm near Pritzerbe (Germany). English : This is a time lapse video showing moving clouds and the famous Tower Bridge in London. English : Emmanuelle Chazal competes in the women's heptathlon long jump final during the French Athletics Championships 2013 at Stade Charléty in Paris, 13 July 2013. English : Kyrie eleison from Gregorian Vespers in honor of Saint Vincent Pallotti (Vesperae de Confessore non Pontifice) recorded by Schola Gregoriana from Pallottine Seminary in Ołtarzew, Poland. Lesser Kestrel (Falco naumanni) birds mating. English : Lesser Kestrel (Falco naumanni) birds mating. Male sweat bee (Halictus tetrazonianellus Strand, 1909), a short-tongued bee, extending its mouthparts. Taken on Mount Carmel, Israel, August 13, 2012. English : Male sweat bee (Halictus tetrazonianellus Strand, 1909), a short-tongued bee, extending its mouthparts. Taken on Mount Carmel, Israel, August 13, 2012. Hedge Woundwort (Stachys sylvatica) in Pakri Peninsula, Estonia. English : Hedge Woundwort (Stachys sylvatica) in Pakri Peninsula, Estonia. English : Aquatic larvae of the common green colonel (Oplodontha viridula) in a pool at the Wollenberg, Germany. A pavilion in the restorated Courtyard of the Lions (Aug. 2012). The polished marble floor reflects the blue of the sky. Alhambra, Granada, Spain. English : A pavilion in the restorated Courtyard of the Lions (Aug. 2012). The polished marble floor reflects the blue of the sky. Alhambra, Granada, Spain. English : Video showing a model of the tunnel boring machine (TBM) "Åsa" used to dig and line the Hallandsås tunnel. The diameter of the cutter head of the real machine is 10.6 meters. The total length of the real machine is 250 meters and the model only shows the first part of it. English : Panorama of Lake Bled. English : Temple monkey (Macaca sinica) sitting on a wall at the foot path heading to the Dambulla cave temple, Sri Lanka. Crique de l'Anau, a cove at the neighbourhood of La Corniche, seen from the east and the Mediterranean Sea. Sète, Hérault, France. English : Crique de l'Anau, a cove at the neighbourhood of La Corniche, seen from the east and the Mediterranean Sea. Sète, Hérault, France. English : Ave Maria composed by Charles Gounod, composed based off of the harmony and texture of Johann Sebastian Bach's Prelude No.1 in C Major from Well-Tempered Clavier Book I (BWV 846). Performance by John Michel.